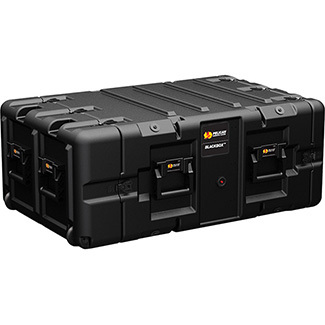 The BlackBox case is a textured roto molded case with a 19" wide and 24" deep EIA standard rack. It is an Off-the-Shelf product. This lightweight, compact, and double ended case offers light duty protection and boasts significantly better light duty shock performance than the competition. The use of recycled materials in the shell and a steel frame offers great value while upholding Pelican-Hardigg's industry-leading standard. A BlackBox case is ideal when you need immediate access to an Off-the-Shelf case and need to be cost conscious without sacrifice performance. Cylindrical Shock Mounts isolate equipment from vibration as well as impact forces. Shock mounts vary in size depending on proteciton requirements - from delicate equipment to rugged electronics. BlackBox cases are an Off-the-Shelf product, in stock and ready to ship.